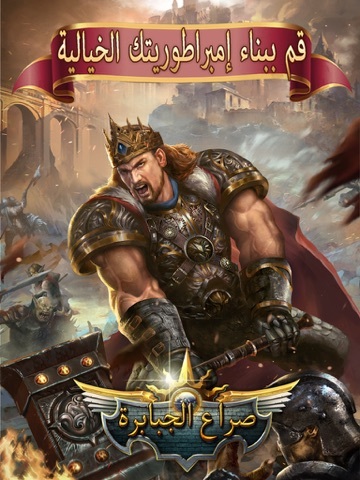 Epic Strategy Game in the Middle East 2016 Clash of Crowns, is a Strategy MMO Game, where you can fight and defend to build your empire. 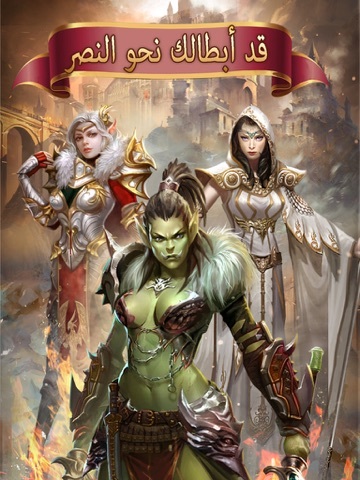 Download and play now for free to write your own legendary empire story. You are the King in this magical world to rule the empire; lead multiple heroes to build and strengthen your empire; raid evil monsters and greedy enemies in the battle, and you will lead victories and conquer your enemies. -Create your own empire: build and upgrade buildings and fortifications. 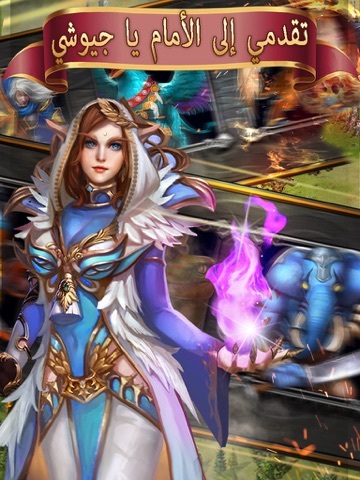 -Multiple heroes, multiple positions, you are free to hire and appoint as you wish. -Train different kinds of troops. 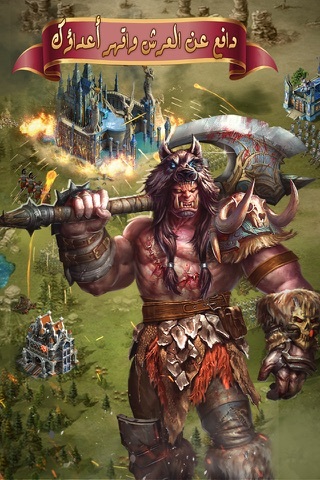 Human, goblin, dwarf, monster, etc troop units are waiting for commanding. -Rally allies to declare Legion war. Support resources to allies. Play with your friends in a real time experience and together to establish the strongest Legion. -Great war range on the world map that you can watch the war as it happens and check out your marching troops in real time. -Chat with all players in the kingdom channel, or in Legion channel to discuss war strategy with allies. -Suit up suitable equipment for your heroes, and embed gems on your equipment to enhance the power. -Special events for special festivals, diversity of events for players to celebrate throughout the year. 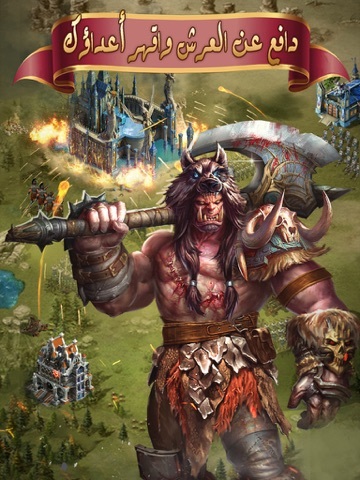 -You will love this strategy game with castle development, strike enemies to rule your empire and dominate the world. The trumpet sounded for battle, what are you waiting for? Play now to get rewards worth $100. قد اخترت أحلى لعبة الحرب الاستراتيجية الملحمية في الأبل ستور العربية عام 2016. ان صراع الجبابرة لعبة بأسلوب سحري، والأهم في الحرب هي الاستراتيجية، تم عرض ساحة المعركة الحقيقية على أقصى حد. لا تنتظر، خذ سلاحك وانضم الى هذه الحرب الملحمية وكافح لنهب القلعة بقيادة قواتك، ودافع عن شرف ومجد الجيش العربي! في لعبة صراع الجبابرة العالم السحري سوف تقوم بدور مالك المدينة ، وتحكم الإمبراطورية الخاصة بنفسك، وسوف تنضم الوحوش والأقزام والعفاريت إلى إمبراطوريتك مما يقويها تحت قيادتك. وتقود متعدد الأبطال لمساعدتك في بناء إمبراطوريتك وتقويتها ولازم أن تداهم الوحوش الشريرة والأعداء الطماع ، وإذا بذلت جهدك باستمرار سوف تحقق الانتصارات وفتوحات العالم. - تدريب أنواع مختلفة من الجيوش لخوض المعركة، الإنسان والوحش والعفريت والقزم وغيرهم من المحاربين في انتطارك قيادتهم. - متجر العصبة وهدية العصبة يعطيك الفرصة للحصول على الموارد النادرة. - حرب لاعب ضد لاعب (PVP) على الانترنت، يمكنك إنشاء عصبة مع أصدقاءك أو مع اللاعبين الآخرين لمواجهة العدو سويا وتحقيق عصبة أقوى في المملكة لفتوحات العالم. 1. New SVIP system added with better Attack and Defense Buff. 2. Two slots added for commander and vindicator. 3. New gems added with healing speed. 4. Troops reinforcement level increase to 10. 5. Hero's level increase to 100. 6. Bunker's level increase to 40 with Larger capacity.